I try to stay fairly positive in my social media posture, but there’s something about Easter Grass that drives me absolutely mad. Forgive the rant or revel in it, your choice. Easter grass is a simulacrum of actual grass. It pretends to be grass, with its neon green color and stringy shape. But it is not grass. Psalm 37 speaks of the wicked who “fade like the grass” yet Easter Grass will not fade. Easter grass is a petro-chemical version of actual grass. What is local and indigenous, we make with foreign oil and the obligation to spend more limited resources to ship it across the country. Easter grass takes what is natural and makes it toxic. Instead of the good grass that springs from the earth, we use foreign oil to make it, fill it with endocrin disruptors and give it to our children while their young bodies are still forming. Easter grass makes uniform what the good Creation make variable. Easter grass reduces all the variety of grass (Rye, Kentucky Blue, Bahia, Fescue & St. Augustine) into the same bloody piece of plastic. Easter grass manages crass commercialization of something that grows wild. Easter grass kills the very nature it pretends to symbolize Birds are attracted to the shimmery plastic, they line their nests with it, eat it and die. Easter grass claims to represent Easter, the holiday otherwise known as the Resurrection of Jesus Christ, yet nowhere in Scripture does Easter grass exist. Easter grass gets everywhere. EVERYWHERE. And when you find it under your couch cushion on the 4th of July or mid-December, you will not think fondly of this as a sign of death and resurrection. No, you will shake your first and vow, “Never again with the flipping Easter grass!” Forget tulips, Easter grass represents total depravity. This year in an attempt to smother us with preciousness, Whole Foods has rolled out its own Easter Grass “alternative.” As far as I can tell, this is not ironic. 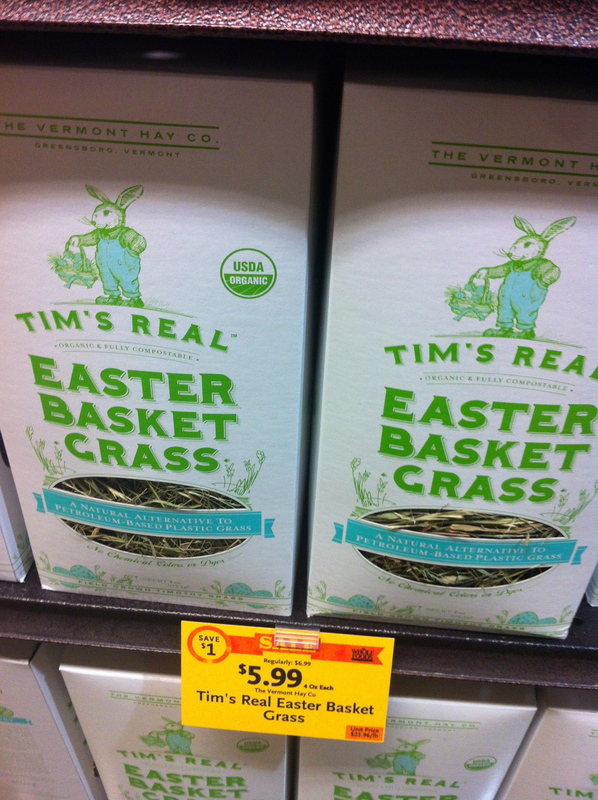 For $6.99 ( spotted a pre-Easter sale of $5.99), Whole Foods will sell you FOUR ounces of “Tim’s Real Easter Basket Grass” an organic, Vermont grown hay to line your Easter basket. In either an act of beguiling genius or total ridiculousness, Whole Foods will now sell you the very thing that you can get for free, but in a retro-cardbord box. Now we can feel virtuous by buying our way towards Easter.